• identify characteristics of how the human figure is depicted (compared to Sumerian and Egyptian styles). 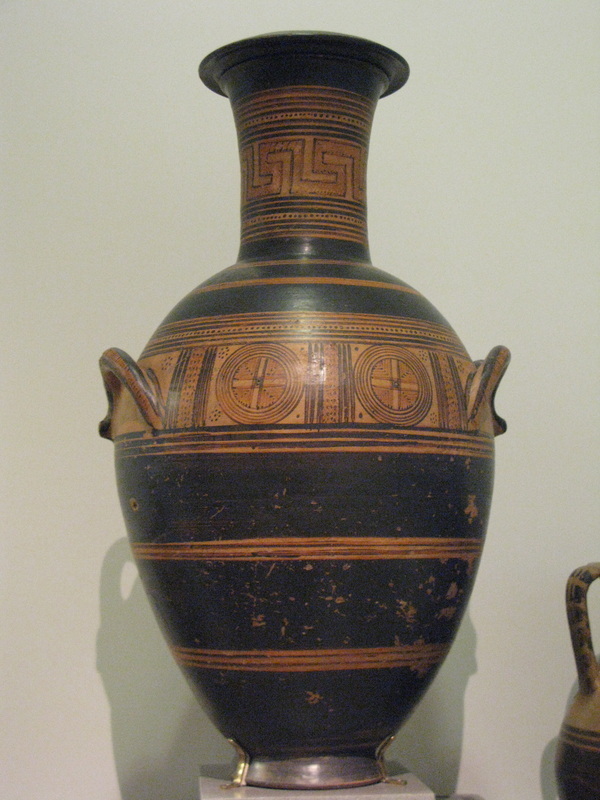 • examine images Greek pottery to identify characteristics of five major decorative styles. • record their observations on a classification chart. 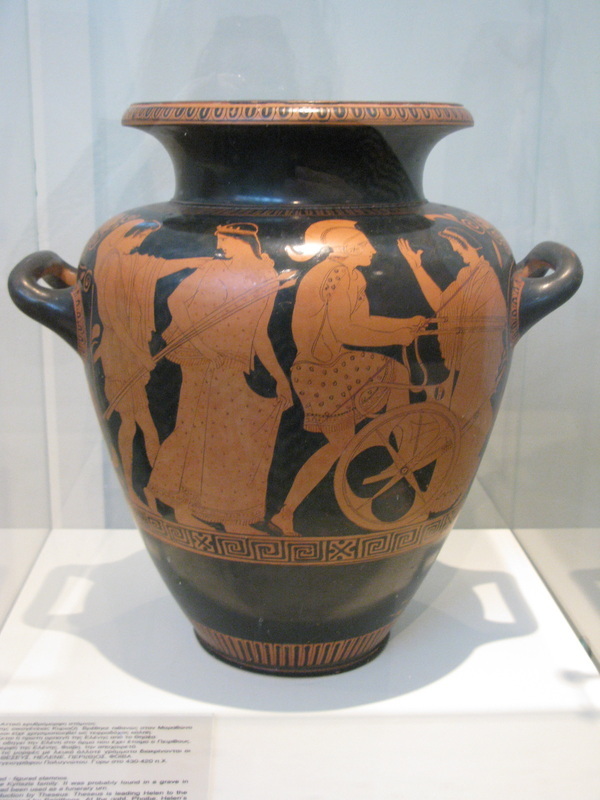 Because pottery was the most widespread of crafts in ancient times, it is the most frequently excavated material found by archaeologists. Though easily broken, even small fragments can provide valuable clues that date discoveries. The artfully painted black and red pottery of the ancient Greeks is especially valuable to historians, because of their detailed paintings. By depicting scenes of everyday life and mythology, these artifacts provide a wealth of information. 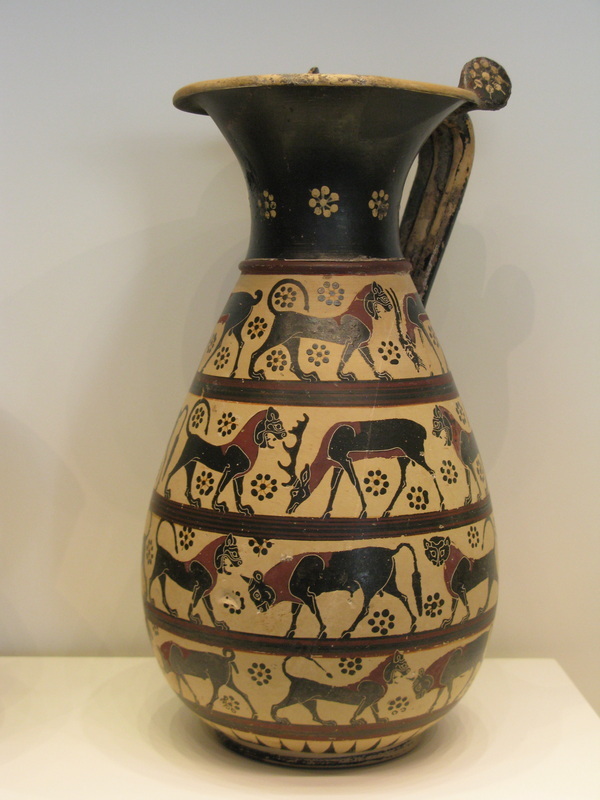 For more than a thousand years, pottery from mainland Greece was traded and treasured throughout the Mediterranean world. Reflecting the influence of seafaring trade, especially with the Middle East, decorative styles changed over the centuries. From the early Mycenaean style of the late Bronze Age to the widely recognized black figure and red figure pieces, the painted decoration can be classified into five categories that correspond to periods in history. 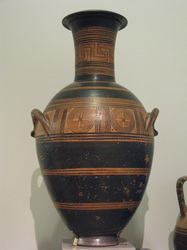 Gather examples of five pottery styles from web images, postcards, and books, Two or three of each style is sufficient. Collect broken pottery shards from the local nursery. Usually they can be obtained for free. Select unglazed terra cotta. white drawing paper for tracing shard shapes. should be able to describe characteristics more easily. Assist groups as needed. (“What do you see here? Give mini-lecture on the importance of pottery to archeologists due to it’s prevalence in virtually all excavated sites. styles change (quickly today!) but focus on how trade and communication creates change. artifacts “in the style of” their time periods. Each student should trace the outline of his/her shard. the shards to “fix” the design). to give added information as needed to help the Archaic and Orientalized groups. with several classes, subsequent groups can see and “classify” pottery shards by style. a short description of the characteristics and time period of the piece based on classification chart. • Alternative assessment: Have three pieces (A, B, C) for entire class to identify by style. • Have students go online to collect examples of all five characteristic styles. Summarize observations. • Mix all fragments and have students classify by style. • Create linoleum block prints using Greek pottery shards as inspiration. • Illustrate a scene from a Greek myth (in the style of one of the five categories) on terra cotta-colored construction paper. • While studying Greek mythology, students create pottery shards using the iconography of a particular god or goddess.